Pastor at St. Luke's Church. Preacher of sermons. Prays well with others. Worry. Fear. Anxiety. This 21st century urban culture we live in is an extremely anxious culture. People worry about all kinds of things. And, with the recent events in Paris, Beirut, and Baghdad, many people all over the world are even more anxious. For good reason! Worry about my friends. One of my friends has an elderly parent who is in hospice. Yes, I’m concerned about the whole family! Worry about jobs. Some people worry about their bosses, or their co-workers. I have several friends who are in need of jobs, and wish they could have the luxury of worrying about the situation at work! So, there’s worry about finances in there, too. Worry about health and about family. One of my sisters had a knee operation several months ago. She lives out of state, and I haven’t heard from her in a while. Worried? Concerned for her and her mobility? Yes, I am, at least a little. All of these situations are troubles, concerns. Worries. The news on the radio, on the television, different media websites—all depend on worry and anxiety to pull in their viewers. And with recent events, many of the politicians worldwide are having a field day. And the media outlets? Trying to get the public on the edge of their seats, to keep tuning in, or buying their products. A never-ending fearful circus. Here in our bible verses this morning, our Lord Jesus is telling us not to be filled with worry. Worry—anxiety—fear. When we come right down to it, this yucky predicament sounds familiar. We might not like it, we might be uncomfortable with it, but these various negative situations still happen to many of us, on a regular basis. All the worry and anxiety just mentioned? That was mostly external. Looking outward. Yes, common to all of us. Let’s up that worry and anxiety one notch higher. Let’s sprinkle some self-centered fear on it. Add a few dashes of worry, and pile on concern about foreign people, faraway places, and strange-looking things? Does that sound familiar, too? Fear of the interior. That’s the inside job. Your insides, my insides. Our feelings and emotions, everything all mixed together like with a blender or a kitchen mixer. I can imagine some people are so anxious and worried about what’s going on inside of them that they don’t even want to examine themselves, and do an inventory. They would far rather hide under a blanket. Or check out in other ways that involve various preoccupations or addictions. Sure, emotional insecurity is very real. Lots of people feel alone. All by themselves, and cut off from others. Bitterness and frustration can make things worse. Worry and anxiety can magnify those kind of feelings, way out of control. The last few verses of Matthew 6 is the Gospel reading for Thanksgiving this year. Jesus preaches one of His signature sermons at the beginning of His ministry, the Sermon on the Mount. He deals with a whole bunch of topics here. The Beatitudes, the Law Code of Moses, prayer, judging others, and worry. Our reading for today. How on earth are we supposed to get thankfulness out of worry? Or not worrying? Seems like this is about gratitude’s opposite. Worry. Anxiety. Robbing our lives of peace, joy and serenity. I have heard a good deal about worry and anxiety in the past few years. In my previous job, I worked as a hospital chaplain. Yes, I would pray with anyone who asked. But, I would also listen. As I listened, I heard about a whole lot of worry, anxiety and concern. And, rightfully so! Anxiety about upcoming treatment, worry about finances, awkward anticipation about losses of various kinds. But I would also hear about depression, anger, and self-pity. I’d hear about these painful emotions mixing and crashing around inside of people, and oftentimes, I would be helpless to do anything about it, except listen. In personal life today, I have concerns. Sure, I have thoughts that sometimes preoccupy my mind. I can live in yesterday for too long of a time. I sometimes look forward to tomorrow—or next week or next month with some fear and anxiety. But what is the overarching message of this reading? What does Jesus tell us in this paragraph from the Gospel of Matthew? He talks about the beauty and the vastness of God’s creation. He tells us to lift our heads and look around. Doesn’t God take care of the birds of the air and the beasts of the field? Yes, stuff happens. Life happens—and then some, at times. But if God takes care of the birds and the beasts, think about us. Think about you and me. Do you think for one minute that God would forget about you? Or, that God would forget about me? I think some of you might have heard these little sayings: “It’s hard by the yard, but it’s a cinch by the inch.” And, “How do you eat an elephant? One bite at a time.” Anything can seem overwhelming, if we look at the whole huge thing at once. Sure, life does have challenges. And then some! However, Jesus’ words are really wise: “34 So do not worry about tomorrow; it will have enough worries of its own.” In other words, one day at a time. 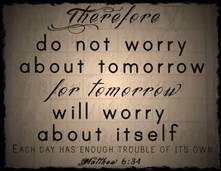 “Don’t worry about tomorrow!” Those aren’t my words—they’re the words of Jesus! Some of you might be saying, “That’s all very well, to say those words. Words are pretty, but do they have any action? Do they have any lasting effect on me, on you? How does it work? In real life?” What does worry and concern do to me? To you? In real life? One way to deal with worry and concern is to practice a breath prayer. A breath prayer has two parts: first, a name of God that fits the prayer and the second a short request for help in dealing with the problem. For example, “God, help me feel okay at the dentist.” We can say God’s name while breathing in, and the request is said while breathing out. Breath prayers can work for little worries, and big concerns, too. Jesus says these one-day-at-a-time words from Matthew 6 to each of us, today. We can take these words home with us, today. These words urge us to let go of our worry. Jesus offers us an amazing gift. The possibility of God’s presence, through the challenges of life. God being with us, protecting us from that worry and anxiety. Shielding us from anything that would rob our lives of peace and joy. Praise God! God continues to help us deal with worry and anxiety, no matter how big our concerns are, or how little. Whenever and wherever they might pop up. It seems there is nothing greater for us to be thankful for. Gratitude? You bet! Grateful to God for God’s love, protection and tender care. Here, and hereafter. We can all say amen to that. Alleluia, amen! Suggestion: visit me at my daily blog for 2015: matterofprayer: A Year of Everyday Prayers. and my other blog, A Year of Being Kind . Thanks! Who here knows the words of the Apostles Creed? Who studied the Apostles Creed before they were confirmed? I know I did. I studied Martin Luther’s Small Catechism, and went over every part of the Lord’s Prayer as well as the Apostles Creed. We are departing from the Gospel of Mark. I’ve been preaching from Mark for the last two months. We have been following Jesus through His discussions with the Jewish leaders about all kinds of aspects of the proper religious life. Today, we make a big jump forward, to the New Testament passage from the letter to the Hebrews. This is after the Resurrection, after the book of Acts, and the Apostles have now been sent out into the world to tell all people about the risen Jesus, and about God’s love and forgiveness of their sins. This letter to the Hebrews is a circulating letter. 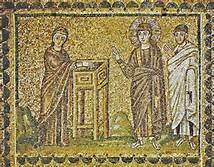 That means it and other circulating letters were sent from place to place in Asia Minor, so the small, struggling churches could receive encouragement and teaching in writing from the Apostles and other new church leaders. This particular letter was sent to Jews who lived a long way from Jerusalem. In essence, ex-pat Jews. What about those Old Testament priests in the Temple in Jerusalem, anyhow? They needed to keep on sacrificing animals over and over and over again. Why? The people of Israel had a Sin Problem. The priests had to keep sacrificing to cover the Sin Problem, to make it better. To atone for the sins of the whole people. And no matter how hard they worked, or how many animals they sacrificed, or how much they prayed to God, it was never enough. There was always more sin. The nation of Israel and all the individuals in Israel had a Sin Problem. How many people can relate to this example? Dirt, mess, dirty dishes and black marks in a crowded house never end. Just so, in the case of the priests and the sacrifices for sins that everyone commits, the Sin Problem never ends. For real! Never, ever! People are sinful. They keep doing and saying and thinking things that go against God’s laws, and sin never goes away. All the sacrifices ever brought before God could never make one dent in the Sin Problem. The whole repetitive process of endless animal sacrifice? Jesus came and broke that process. He ended it. He made that process obsolete, not necessary any more. Instead, Jesus and His death for us on the cross reaches way beyond animal sacrifice. At first glance, some people might think that Jesus did not finish His work as High Priest. But, that is just the point! He did finish the work. The other priests had to continue to stand, because they had to continue to offer sacrifice after sacrifice on a daily basis. Because of the Sin Problem that just wouldn’t go away. Jesus did complete the perfect sacrifice. His sacrifice brought perfect, complete forgiveness of sins. Jesus was all done, and He sat down. The Sin Problem went away, once and for all. But, wait! There’s more! Jesus doesn’t just sit down any old place. On any old bench, or in somebody’s creaky rocking chair. No. He takes a seat at the right hand of God. A place of great power and great authority. Jesus—the Son of God, the Second Person of the Trinity, incarnated by the Holy Spirit of the Virgin Mary—Jesus takes the number one seat in all of the universe, next to God the Father. The resurrected Lord Jesus is God the Father’s right hand man. 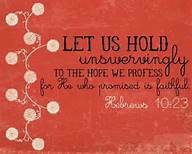 It says so, right in our scripture text from Hebrews today. I want everyone to notice that all the pronouns here are plural. That means we—all of us together—can have confidence. We—all of us—can walk right up to God. We can come into God’s presence and boldly bring our requests to God. As I say in our weekly pastoral prayers, we—all of us have free access to God. Not like the Jewish people before the time of Jesus, who were still dealing with the Sin Problem and still needed an intermediary between them and God. But because Jesus, our perfect High Priest, has cleared the way. Jesus has invited us to come. We are very welcome to enter into God’s presence! This section from the letter to the Hebrews answers our questions about “where is Jesus now?” The risen Jesus is with God and is Lord! Do you have the confidence that your Sin Problem is taken care of? Do you dare accept the invitation that Jesus extends to us? Can we grasp that assurance that God welcomes us? This scripture passage clearly lets us know about that boldness. That “free confidence,” grounded on the consciousness that our sins have been forgiven. As I say every week after the Confession of Sins and the Assurance of Pardon, believe the Good News of the Gospel. In Jesus Christ, our sins are forgiven. http://www.workingpreacher.org/preaching.aspx?commentary_id=142 Commentary on Hebrews 10:11-25 by Amy L. B. Peeler. I have a friend who is recently retired. He goes around town, quietly, and does good. He was raised in the church, but that was a good many years ago. Yes, he does have a belief in God, and he expresses that faith by doing good for others and being faithful. Sometimes that means driving people to a doctor’s appointment. Or volunteering at a local not-for-profit organization. Sometimes that means picking up the left-over baked goods from a business at the end of the day, at closing time. And then, delivering the baked goods to a homeless shelter. He does all of this without thanks, with little or no fanfare. He is faithful. He is dependable. He contributes, in any way he can. And, I am so glad he is my friend. We turn to the Gospel reading for today, from Mark 12. Jesus and His disciples are in Jerusalem, and Jesus is having another in those continuing discussions with the chief leaders and teachers of the Jewish Law. They happen to be in the rear of the Temple. Large sanctuary, lots of coming and going, to and fro. Wait, didn’t the congregation at the Temple in the first century pass an offering plate? How did they collect money to keep the doors of the Temple open? And, was there any outreach, any charitable giving being done? So, different cultures and different places of worship, not to mention different centuries. We are looking at a slightly different practice of collecting money. Just to make sure everyone is on the same page. The principles of giving and generosity are the same, and those principles span the cultures and the centuries. Remember how open, how blatantly obvious the religious leaders were, about their religious observance? Their ostentatious prayer practice, their ritual observance of washing and cleanliness, their attention to the least little bits of the Jewish Law Code, and their finger-wagging and complaining about other people who weren’t quite as observant? So, of course the prideful extra-observant people among the religious crowd would be extreme in their giving practices. Talk about being a show-off! What is this? Jesus does a compare/contrast sort of thing. He compares the large contributions of the rich people with the measly two small coins that the widow contributed. Large amount compared to a small amount. We will take a short detour and look at our reading from the Old Testament for today. This passage from 1 Kings is a fascinating reading, about how God provided for the prophet Elijah in the time of an extended drought. I could have preached my sermon to you from this reading! But pairing this passage with the reading from Mark makes a more powerful story. Elijah was one of the most prominent prophets in the Old Testament. He was God’s spokesman in a time when the nation of Israel was not following God very well at all. King Ahab was married to a foreign Queen named Jezebel, who led Ahab and much of the rest of Israel into idolatry and worship of false idols. That is one of the reasons why God sent an extended drought onto the whole region of the Middle East. Elijah listened to God, and God communicated to Elijah to head up north, near Damascus, to the home of a non-Jewish widow in the town of Zarephath. Ordinarily, widows were not very well off, with no husband and little means of support. This widow was really, really poor. By the time Elijah arrived at her house, she only had one bag of flour and one jar of oil left in her pantry, and that is all. Hard for us here in the Chicago suburbs to believe that she had so little. Remember, it was a time of extended drought,food prices must have been going through the roof. Elijah worked a miracle. God provided for the widow, her son, and the prophet. The widow made food for her, her son, and for their tenant the prophet Elijah, every day. The bag of flour and the jar of oil did not run out for months, until the Lord allowed the rains to return and the crops to grow again. Did you hear? God provided for them, out of God’s abundance. Did everyone hear what Jesus points out? All of these show-off rich people gave a portion out of their abundance. But the poor widow? The widow gave extravagantly. She gave over and above. She gave, trusting in God’s abundance. She gave, hope-filled, looking to God to provide for her needs. Like the widow in Zarephath, centuries before, this widow in Jerusalem trusts God to provide. This widow decides that everything she is and has belongs to God. But, the treasurer and trustees at the Temple might have had a problem with this kind of thinking, and this kind of giving. Guess what? Too bad! What is valued and lifted up by Jesus, what is important to the Kingdom of God is not what is valued in this world. God does not have a dollars-and-cents kind of perspective! This vignette is just a slice of the widow’s life. But, I’d like to follow the widow home. See how she treats her neighbors. Does she bring over a pot of soup to a sick friend? Does she clean the apartment of someone who has fallen and broken their leg? And what about her listening skills? Is she someone people come to, to talk about their troubles? Giving to God is so much more than just dollars and cents. So much more than just the coins the show-offy rich people put into the collection box in the Temple. What about us, today? How can we take this scripture lesson today, and apply it to our lives? Is it just a nice story about what happened to people in Jesus’s day? Or, is it much more? Today, we all can be like the widow in Jerusalem. This widow gave extravagantly. She gave over and above. She gave, trusting in God’s abundance. And, this widow decides that everything she is and has belongs to God. Like my friend I told you about, who does lots of things without thanks, with little or no fanfare. We all can be faithful. We all can be dependable. We all can contribute, in any way we can, to God and to God’s kingdom. God willing, I’ll contribute to God’s kingdom. Will you contribute, too? Alleluia, amen. Rule books are handy things to have around. What about the rules of the road? Doesn’t it help everyone to know and understand the rules of driving? Plus, the rules of the road give us a handy guide for safe, reliable, consistent driving. Also, we can think of rules in sports; in football, baseball, hockey, and basketball, just to name a few. All of these rules help teams, individual players, and referees to understand what to do—and what not to do in a game. Do you know one particular person who knows the rules of one particular sport backwards and forwards? I mean, this person can call balls and strikes faster than an umpire behind the plate. Or, can figure out exactly who went offside before a football snap, or when a player got fouled in a fast-moving hockey game? It doesn’t have to be one of these sports, but any sport. And, that person is really proud of their exceptional sports knowledge, too? That’s a lot like the situation Jesus is dealing with. As one of the commentators said, “Throughout Mark’s Gospel, the scribes [and teachers] were always evaluating Jesus’ activities. They judged Jesus theologically.” The Rabbi Jesus and some high ranking teachers of the Law are having another in their series of continuing discussions. These teachers really enjoyed discussing the Law, and both the major as well as the minor points of Judaism. Some teachers would get all excited and rub their hands at the prospect of a good argument! I mean, discussion. That’s where we pick up our thread of the narrative. Different rabbis or teachers had different opinions on what was the greatest of all commands. I am certain some of these teachers wanted to know what Jesus considered the “most important” of the 613 laws in the Mosaic law code, which was (and is) the official, orthodox Jewish rule book. Jesus does not name one of the “big 10,” the Ten Commandments. Instead, He responds with the Shema. “Hear, O Israel: The Lord our God, the Lord is one. 30 Love the Lord your God with all your heart and with all your soul and with all your mind and with all your strength,” from Deuteronomy 6:5-6. Just from this short excerpt from Chabad, an orthodox Jewish website, you can see how serious this was to the scribes and teachers of the Law, in Jesus’s day as well as today. So, yes. Keeping rules properly was really high on the observant Jew’s priority list. Going back to Jesus, and His response, what IS the greatest commandment, anyway? Jesus did say that the greatest command was the Shema, a basic, fundamental, foundational statement of faith. Love God. Period. This was also a standard daily prayer in Jewish tradition. I suspect everyone in the room with Jesus knew Deuteronomy 6:5-6 so well they could say it backwards, or in their sleep. But, Jesus doesn’t stop there! No, He makes another definitive statement. “31 The second is this: ‘Love your neighbor as yourself.’ There is no commandment greater than these.” Did you follow that? Jesus made “the greatest command” into a two-part command. Love God, love others. Two sides of the same coin. Jesus quoted from another verse in the Hebrew Scriptures, Leviticus 19:18b. Yes, it was included in the Mosaic Law Code. In the Jewish rule book. Except this particular law wasn’t considered so all-important in Jesus’s day. That is, until Jesus reached back and pointed to it. You’d better believe this two-part law applies to a modern world torn apart by arguments, resentments, mourning, sadness, bitterness, and downright hatred. Not to mention war, violence, drought, hunger, and natural disasters, just as much as it applied to similar situations in ancient times and places. Even though this modern world finds it difficult to come near to God, even to believe in the concept of a Higher Power; this two-part law still applies. Love God, love others. Remember, these are the words of Jesus. In this vignette from the Gospel of Mark, one particular scribe engages with Jesus. “Well done, Teacher!” the scribe responded. “You’re right when you said: ‘He is the only God and there is no other god besides him,’ ‘Love the God with everything you have,’ 33 and, ‘love your neighbor as yourself.’ Obeying these commandments is worth far more than all the worship in the Temple at Jerusalem!” These words are not combative, or argumentative. This scribe agrees with Jesus! The Gospel describes this teacher as sincere, affirming of Jesus and His statements. Plus, this teacher acknowledges that the institutional aspects of Jewish ritual and observance are less important, secondary to loving God and loving others. Isn’t it true that religious ritual so often gets in the way of truly loving? The simplicity, truth and wisdom of love is at the heart of the Good News. Are there things we are engaged in right now that are secondary, less important that Jesus and His call to love God and love others? Think about it. If we truly love, what else is necessary? Love God, love others. Jesus’s greatest command. Thanks to Rev. Edward Markquart and http://www.chabad.org for their assistance in the formulation of this sermon!